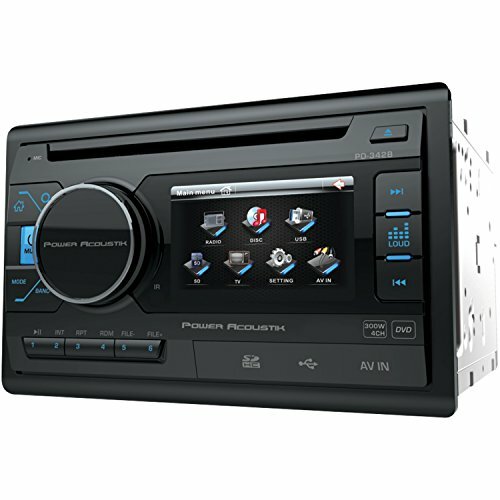 The PD-342 3.4" Double-DIN In-Dash LCD Touchscreen DVD Receiver from Power Acoustik is a media player can handle DVD, CD or 32GB SD Card/USB flash drive and supports MP3 and WAV audio files and MP4 video files as well. The unit has a 3.4" LCD touchscreen with 480 x 240 widescreen resolution with 400 nits LED backlight. The unit has 75-watt x 4 MOSFET speaker outputs, multiregion FM frequency stepping, front, rear and sub preamp audio outputs, video output for aux devices and rearview camera input with trigger. It also accepts a Farenheit OEM and steering wheel control interface.